This striking species belongs to a genus of large butterflies characterized by enormous owl-like eyespots on the undersides of the hindwings. In both sexes, the uppersides of the forewings are dark brown with a bluish tint and a white line running through. The hindwings are black with a dull blue base. The undersides of the wings have an intricate brown and white, featherlike pattern. 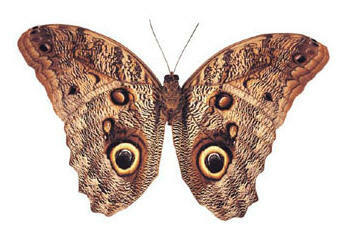 Owl butterflies fly early in the morning and toward dusk.